Cover: Merino & Fajardo Jr.
Whoo-wee! 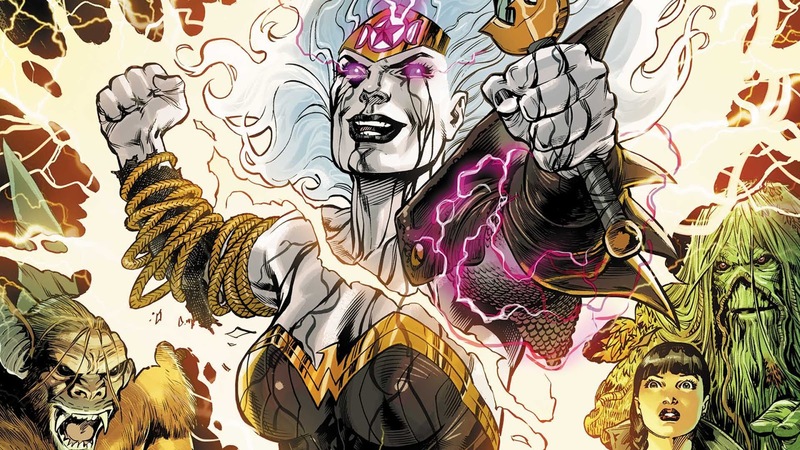 If you’ve been reading Justice League Dark’s last three issues…which are the first three issues, then you’re probably excited to see what this crossover thing is all about. If you haven’t been reading Justice League Dark…well, maybe you’re just a fan of Wonder Woman or something. I’m personally interested to see what this is all about, so let’s roll right into my review of Wonder Woman/Justice League Dark: The Witching Hour #1, commencing now! 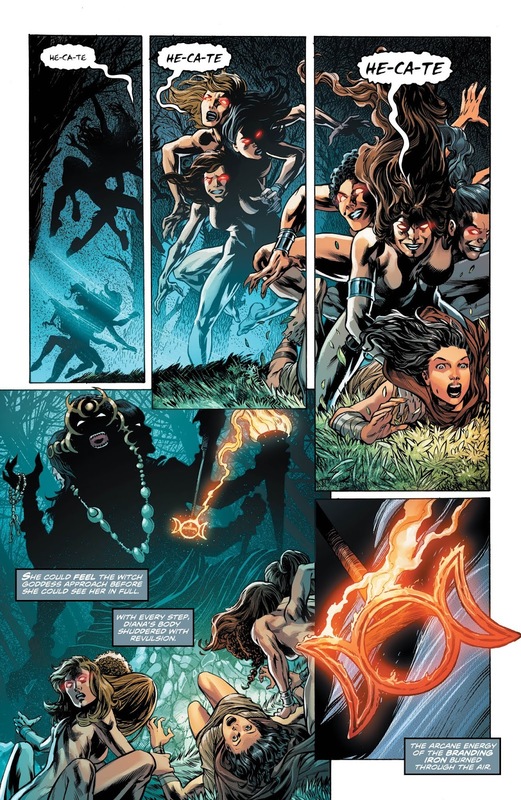 So just to bring you up to speed, if you’re not reading Justice League Dark: the realm from where applicable DC characters get their powers is feeling taken advantage of, and so they sent a super-powerful, super-creepy albino monster dude called the Upside Down Man to wreck shop. Exhibiting abilities even beyond Swamp Thing’s, the Upside Down Man seemed victorious, until he touched Wonder Woman’s tiara and turned her into a white-haired lady with bleeding eyes that busted out the magic-based figure-four leg lock. The book opens with the cause of Diana’s transformation: as a mischievous Themysciran child, she scampered off into the woods and came upon some witches doing a ritual to raise Hecate—the triple-faced Ancient Greek goddess of witchery. Hecate herselves pounce on young Diana and brand her forehead with some kind of magic sigil that looks like a buncha moons. 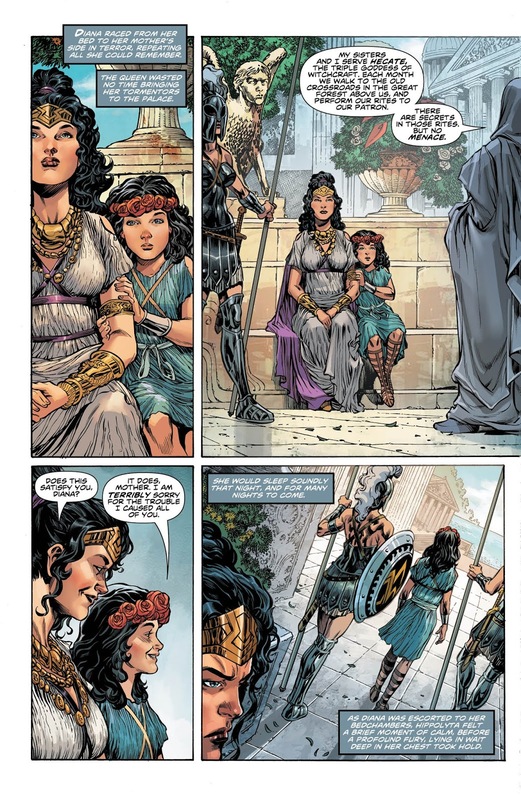 This secures some secret magic within Diana, that would reveal itself at the right time…for instance, at the end of Justice League Dark #3. 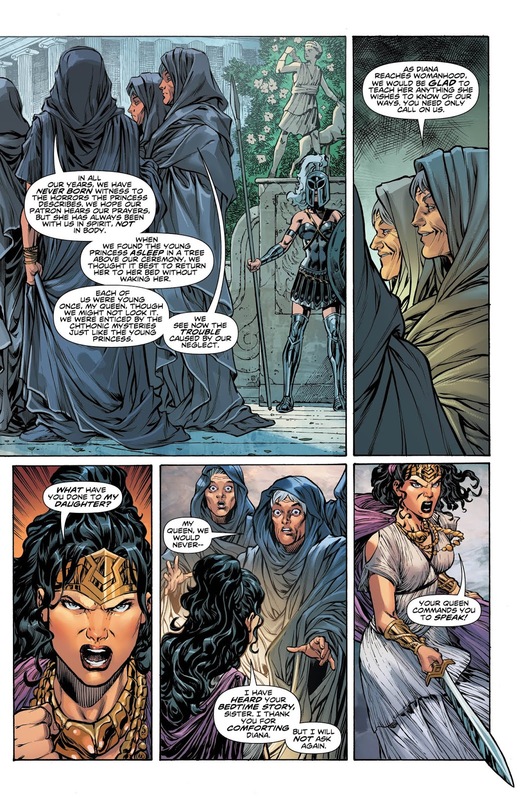 Wonder Woman and the rest of her posse head over to the plain ol’ Justice League to warn them of an oncoming magic kerfuffle, and they seem concerned, but when the JLD leaves, Hecate casts a spell to make them forget all about it. Conveniently, they all forgot to call their mothers as well. Damn you, Hecate! Back on, uh, Earth, all of the witches around the world are congregating at Detective Chimp’s Oblivion Bar for some regular meeting. Among them is Rebecca Carstairs, aka Witchfire, a famous model and entertainer, who walks around with her shoulders on fire. John Constantine also lurks in the background, as usual. The witches in attendance begin their usual evil rites, then Witchfire turns all white witch with the same forehead brand as Diana and burns everyone alive while Hecate taunts them—Traci 13 and Nightshade get away through a portal, which is convenient because they were two of a very few number of characters that existed before this issue. 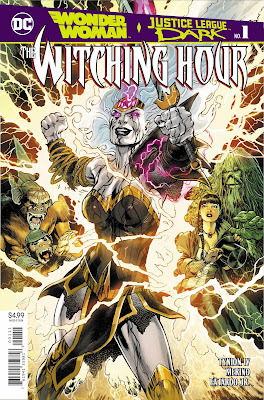 Meanwhile, beneath the Hall of Justice, the Justice League Dark are hanging out, playing with a Ouija board or something, when Diana goes all white witch again! This time, she opens the floor to Hecate, who is all gigantic and ethereal. Zatanna tells Detective Chimp to help, then she kneels before Hecate, as her father taught her. When Bobo finds out the JLA have been occluded, he tells Swamp Thing to get them into a closet, which he does by distracting Hecate with other Swamp Thing bodies. Inside the closet, Detective Chimp activates his entrance to the Oblivion Bar, where they find only John Constantine, drinking and smoking—and like a dozen charred corpses littering the floor! This is pretty cool for the opening salvo to what could prove to be a somewhat complicated story. I love DCU’s “Dark” line, so this is right in my wheelhouse, but I wonder what folks that are less familiar with this book will think (and you can let me know in the comments!) Magic-based books tend to have very creative layouts, and there are a few of these in the book, but it reads pretty clearly for the most part, and the visuals are strong, if not particularly dynamic. Very good start to this as far as I’m concerned, whether the whole thing will work will be a matter of maintaining coherency and, of course, a compelling story. A few pages are given over to necessary recap, but most of the book is that spooky, wispy death magic that we've come to know and love from DC Comics. 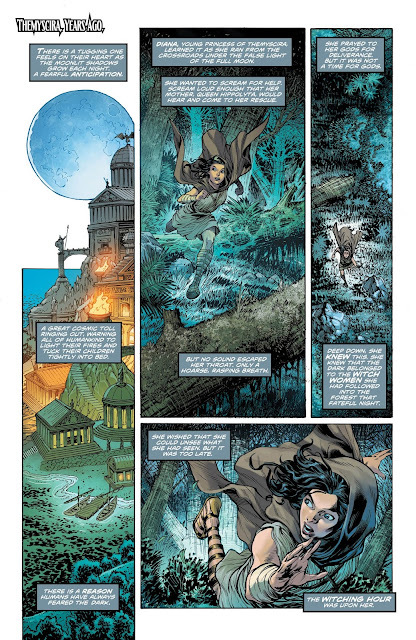 Justice League Dark has proven to be a very solid book thus far, so if you've enjoyed that, you can continue on to this crossover with confidence.